Basel III – watch your step at the entry! Basel III will enter into force in the U.S. and in Europe in about 10 weeks from now. That is soon, and I will argue that banks are still poorly prepared, in particular regarding important securities that count towards regulatory capital. Many banks conveniently look at the Basel III end-state, to be reached in 2019. BNP for example, recently claimed bragging rights for its solid solvency position – with a “Basel 3 fully loaded Common Equity Tier 1 ratio of 10.4%”. Sure, BNP is fine. But what about the entry into Basel III? How well are banks prepared for Basel III when it enters into force on January 1st of 2014? With 10 weeks to go, it does not look good, in particular with respect to Additional Tier 1 hybrid securities. These hybrid securities appear to have been neglected, though they definitely contribute to banks’ capital ratios. Look at what happened to the shortfall in Additional Tier 1 over the years. From 113 in 2011 to 92 bn Euros now. That is not a lot! Especially given the progress made on the CET1 shortfall, which dropped from 228 to 70bn Euro. The 92bn Additional Tier 1 shortfall. I hear you say: Cetier, you are overstating this 92bn Euro Additional Tier 1 shortfall. Fair enough, the numbers may be overstated for the following reasons, but then only slightly. The graph is outdated. It is a snapshot taken on 31 December 2012. It ignores recent issues of Additional Tier 1 hybrid securities. But new issuances, … well this does not look good either. Only three Additional Tier 1 deals this year in the Euro area. One by France and two by Spain – with a total 2.6bn Euro. Therefore, it is unlikely that European banks will close the 92 sans 2.6 billion Euro shortfall over the next weeks. 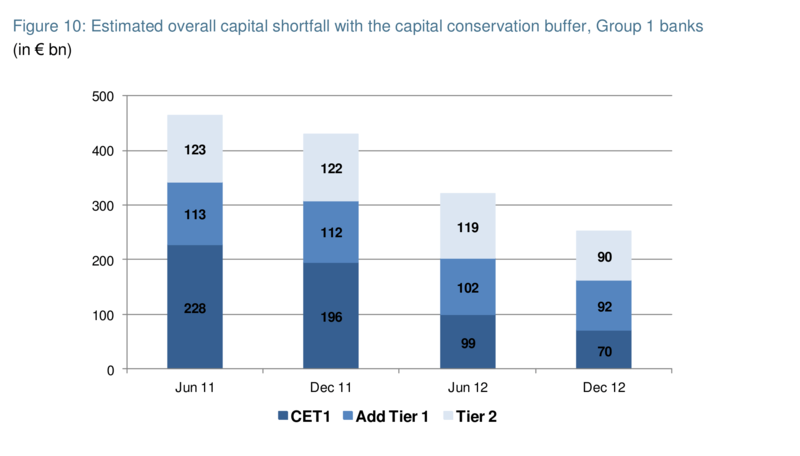 Maybe banks rely on having their hybrid capital securities counted towards Additional Tier 1 from 1/1/2014 on. The graph above ignores grandfathering rules; rules that allow old-regime hybrids to count towards bank capital after a change of capital adequacy rules. The Basel III grandfathering rules are part of the main Basel III text, specifically paragraphs 94 and 95. Further, the Basel III FAQ document offers a diagram that illustrates the grandfathering rules. Click here for the diagram. Complicated as the grandfathering rules may look, the main rule for hybrids is that they should be called as soon as there is an opportunity to call them. If a bank chooses to ignore an opportunity to call, then chances are that the hybrid loses its capital eligibility. In fact, this is what Deutsche bank recently did. It decided not to call a Tier 1 hybrid, which will cause that security to lose its future Additional Tier 1 status. The main rule puts a significant number of hybrid securities at risk of losing their capital status entirely. These securities will not make it into grandfathering; even though there are rules that gradually phase out existing capital securities. The phase-out rules apply to only a limited number of hybrid capital securities. Many hybrid capital securities were issued before the crisis, with an incentive to redeem: a call option combined with a step-up in interest rate after 5 or so years. The Basel III grandfathering rules require these instruments to be called at the first call date, i.e. when the incentive to redeem kicks in. If not called, then most of them will lose their entire capital status. At the time of the publication of Basel III, end of 2010, the grandfathering rules looked sensible. Banks were expected to gradually call old-style capital securities and replace them with Basel III compliant securities. But today, the expectation of 2010 does not look good anymore. Few bank regulators then realized that the 5th, 6th, 10th, etc birthdays of many hybrid capital securities would coincide with the moment of Basel III entering into force: just about now. Banks now are basically stuck with an inventory of Tier 1 hybrid securities that just because of inaction and procrastination will create holes in their capital ratios. Every time an old-style capital security celebrates its first call moment, it will disappear from the banks solvency calculation. The EBA. Part of the inaction may be attributed to EBA, as it took a while to publish the Technical Standards for Own Funds. However on June 5 of this year, EBA published a near final draft of the relevant Regulatory Technical Standards. This draft took away most of the regulatory uncertainty that may have hampered Additional Tier 1 issuances. This near final draft standard should have spurred banks into action. Unfortunately, it remains quiet in the Additional Tier 1 universe. Even with the final technical standards on own funds published, few banks issued Additional Tier 1 securities. One reason I can think of is uncertainty in the market. Investors may find capital securities punitively unattractive. However, I am inclined to dismiss this explanation. The table shows that Tier 2 issuances have picked up this year: of the 20 issues of capital securities in the first 3 quarters, 19 were Tier 2 issuances. Another reason may be uncertainty of the tax treatment of Additional Tier 1 securities. Fiscal rules of some countries may treat Additional Tier 1 securities as equity, rendering their coupon not tax-deductible. Not all European countries have ruled on the tax deductibility of Additional Tier 1 securities – leaving banks in limbo on whether to issue or not. The tax reason may explain why banks in France and Spain, countries known for their tax friendly treatment of capital securities, were able to issue Additional Tier 1 securities this year and banks elsewhere not. My take-away on the inaction in the Additional Tier 1 space: it is not only the banks waiting, but governments wait as well. Ruling on the tax treatment of Additional Tier 1 may prevent banks from forcing their unhappy-birthday capital securities to be left un-called and not replaced by Basel III compliant securities. A tax ruling may offer the required clarity to start issuing Additional Tier 1 securities. It may prevent the looming gradual decline in capital ratios that none of us like to see.